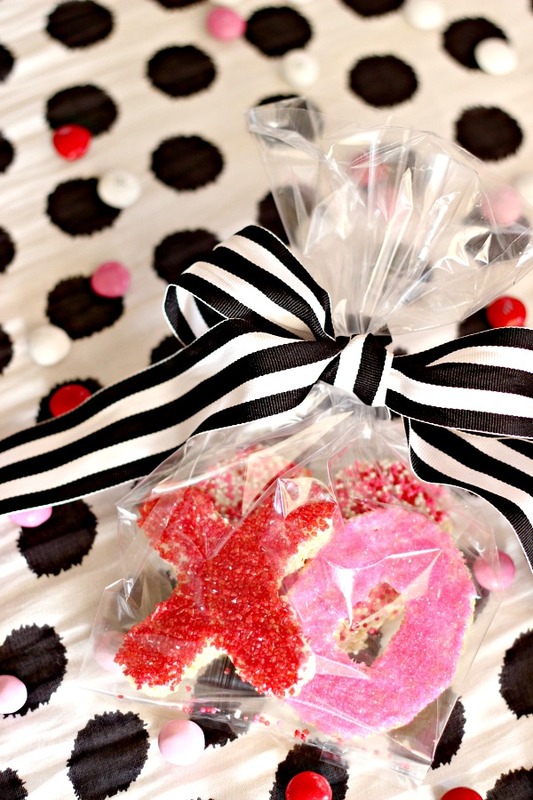 This time I used a "sweets and treats" theme, along with everything being grounded on a base of black and white. 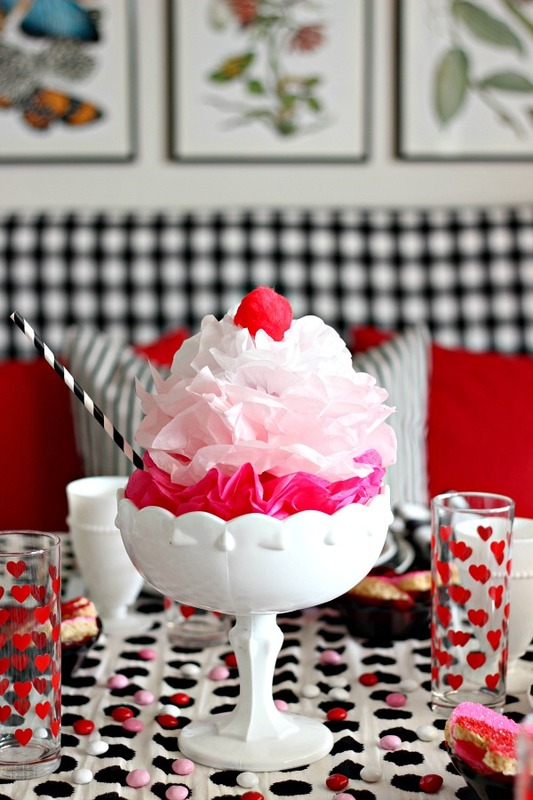 I saw a pin from this party and used the exact same method that I did to make my tissue paper flowers to make the ice cream sundae (I just used fewer layers of tissue paper). I'm actually using these for a ladies' event that I'm decorating for at church (join us if you're local! ), and I'll be sharing more about that at a later time. 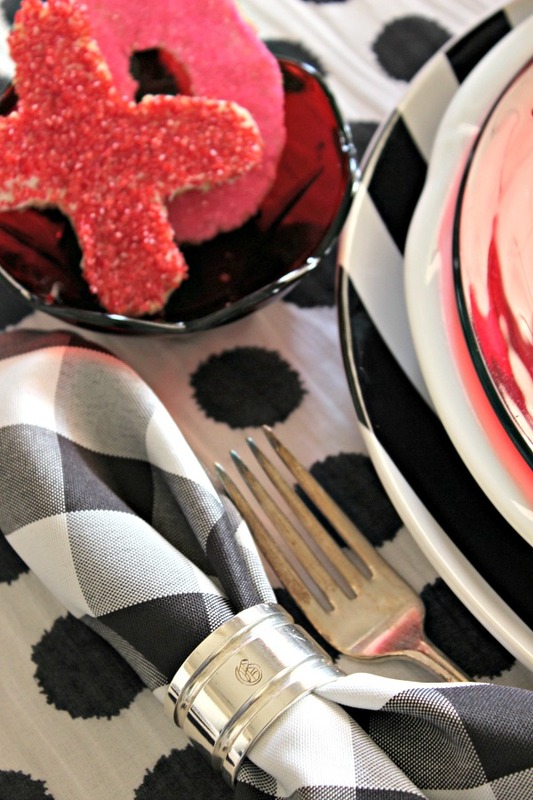 I saw this festive treat in my friend Amy's Instagram feed and thought it would be cute to adapt for my table. I'm sure this idea is nothing original, but here's a rundown of what I did. 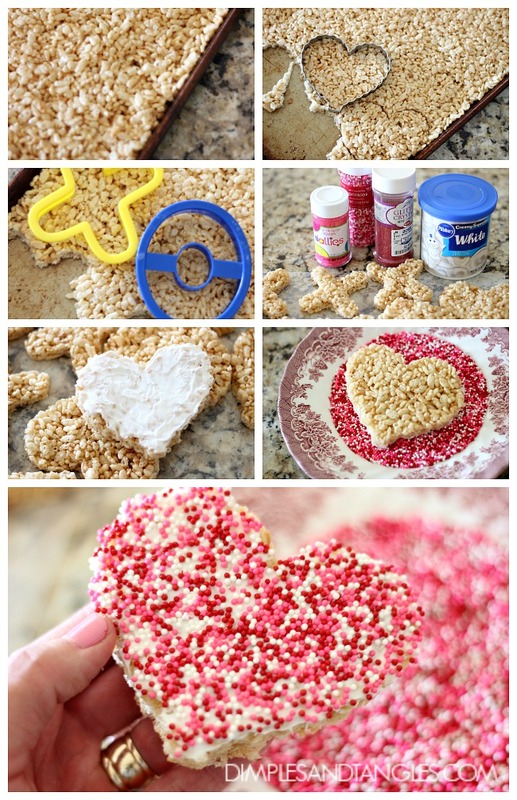 Start with the basic Rice Krispies Treat recipe. 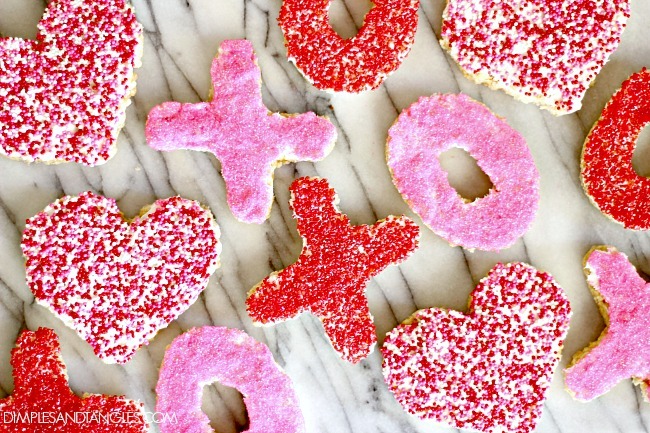 I spread mine in a half sheet pan and then once they had cooled and set, used these alphabet cookie cutters and a heart cutter for the shapes. Then, I spread a thin layer of prepared frosting just to act as a glue for the sprinkles. 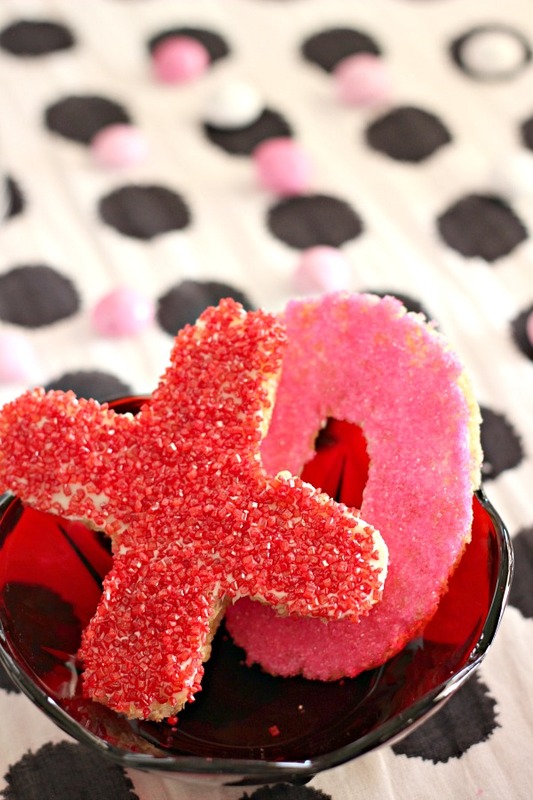 After filling a small plate with sprinkles, I laid the frosting side down and gently pressed to fully cover the heart. 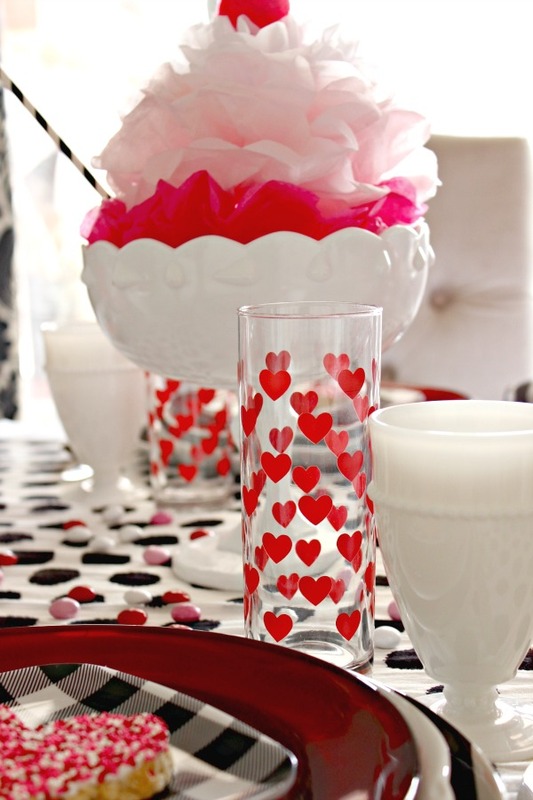 I spotted these darling heart glasses at Dollar Tree (I think the receipt technically said they were vases- oops!) and thought they would add an extra festive touch to the table. They'll be fun smoothie glasses, too. There are the bargain napkin rings that I picked up at an estate sale a few weeks ago, which I know were meant for me because they were already monogrammed with a "G"! The polka dot runner is a scarf that I've had for a few years, and my Mother-in-law sweetly let me borrow some pieces from her beautiful collection of Ruby Red dishes. 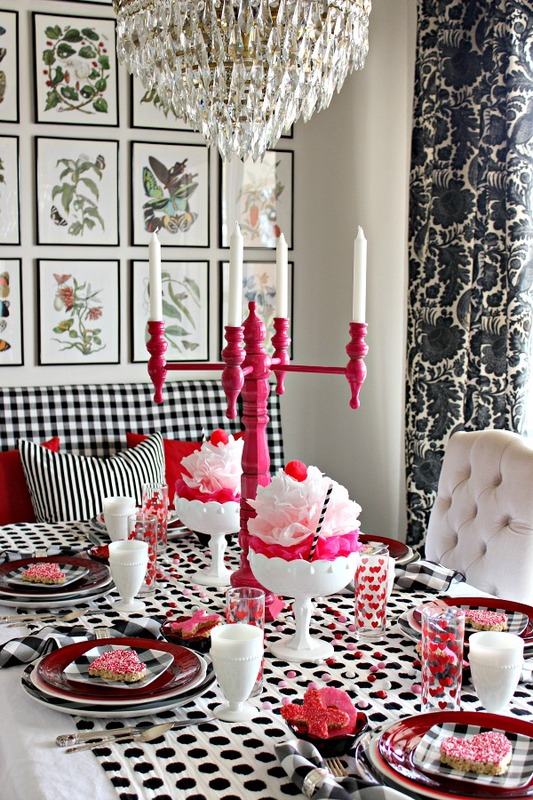 I'm excited about our family Valentine's Dinner, now I just need to decide on a menu! Do you enjoy going out or staying in for the big day? 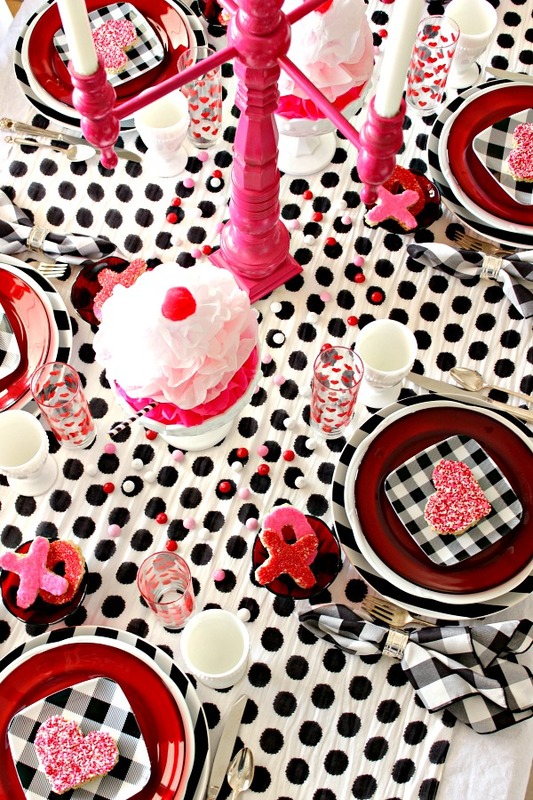 Your Valentine's table is adorable. 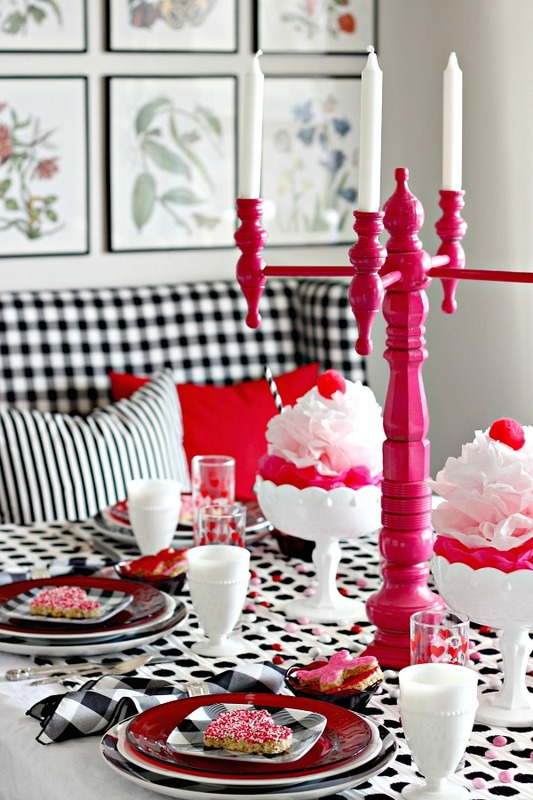 I'm in love with those ice cream sundae centerpieces! Love it, those tissue paper sundaes are amazing. What a great idea. 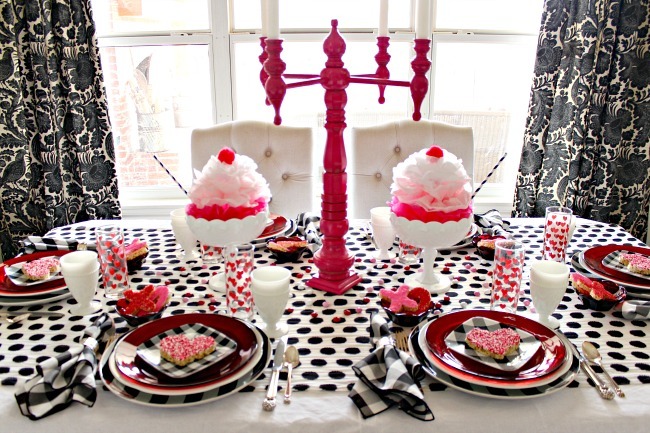 Oh my what a spectacular and fun table to share with your "Valentines"...adore everything black and white, as usual, lol!! 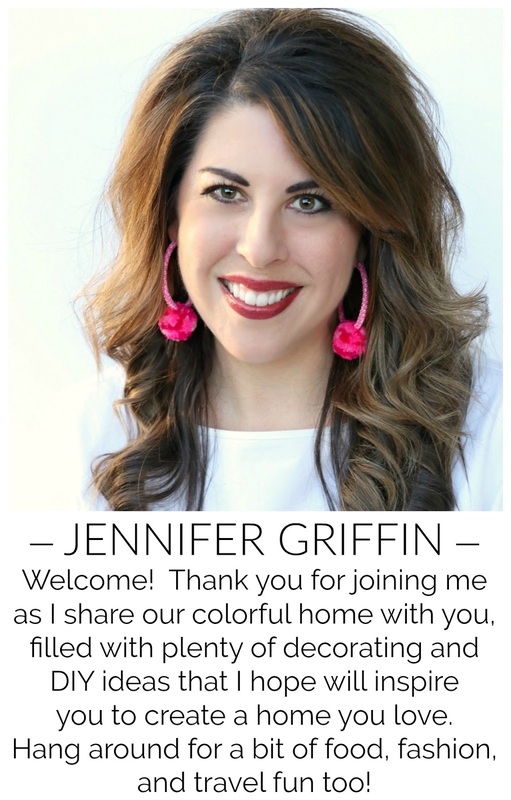 Love your use of bold, beautiful colors in all your decorating. Can't wait to see pics of your church party..
Just about the time I think you can't out do yourself you post something like this. I love this whole table. You have much more "color courage" than I could ever imagine. Your powder room just blew me away, I WANTED it. I still want it. Thank you so much for all you share. 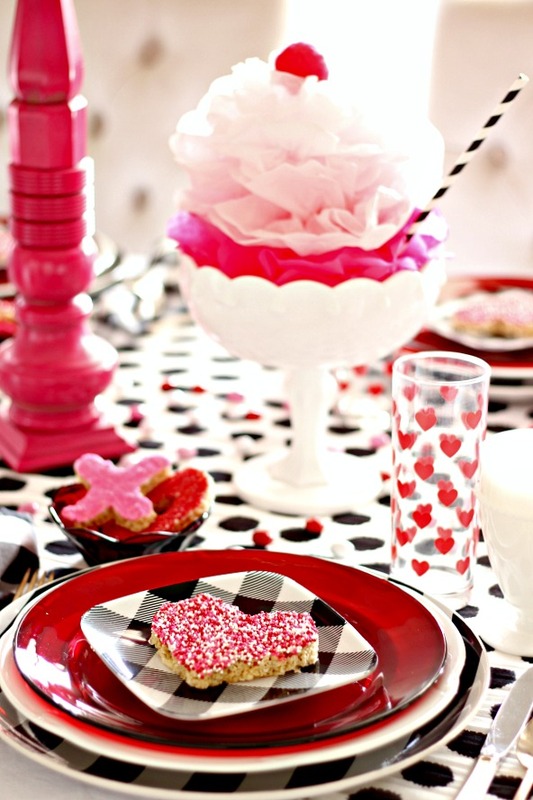 Cute table! My first thought was 'are her kids really not going to graze all those m & m's right off the table??' Mine totally would! Adorable. I have some red and white dinner plates. Your B & W checks are perfect accent. 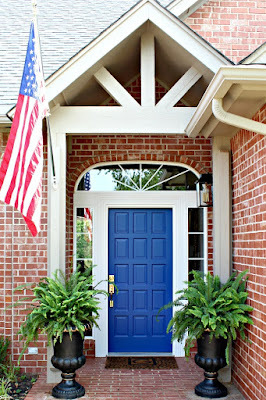 May I ask what material they are and where to get some as they are quite unusual. 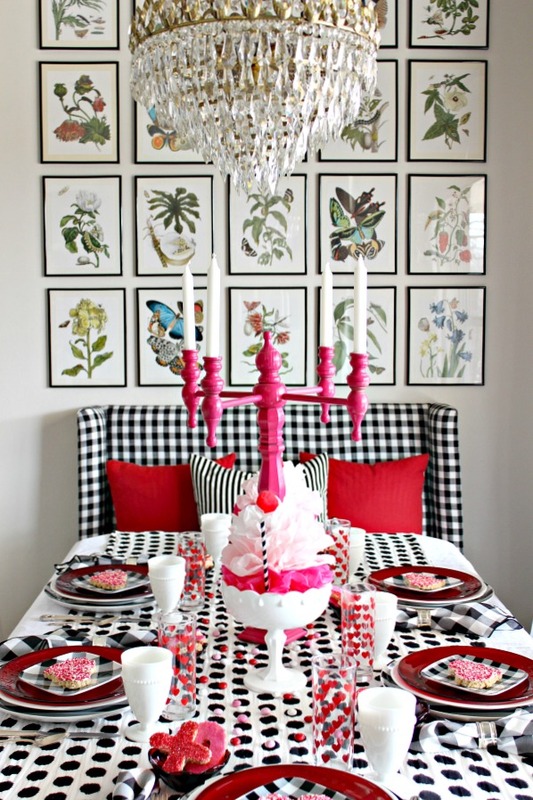 I knew I should have grabbed those target gingham plates! 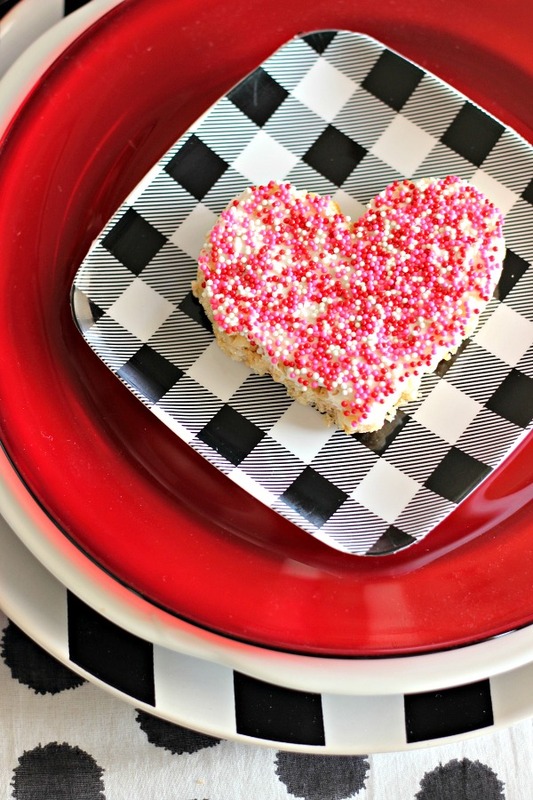 Love the Rice Krispie treats with the sprinkles too. This is adorable! I love the "sundaes"!!! After all these years I like to go out and not have to cook or clean up! What a post. Your creation is amazing one.Very attractive.